Fitness Professional’s Handbook, Seventh Edition CE Course, provides fitness professionals the knowledge to screen participants, conduct standardized fitness tests, evaluate the major components of fitness, and prescribe appropriate exercise. List the health-related benefits gained through regular participation in physical activity and exercise and evaluate various fitness components in order to implement an exercise program to improve each component. Describe how measurements of oxygen consumption can be used to estimate energy production and identify the approximate energy cost of recreational activities, sport, and other activities. Explain how muscle produces energy aerobically and anaerobically, and evaluate the importance of aerobic and anaerobic energy production in fitness and sport. Calculate and interpret BMI, as well as assess body composition using a variety of techniques and describe the advantages and disadvantages of these techniques. Develop an exercise prescription with the exercise intensity, duration, and frequency needed to achieve and maintain cardiorespiratory fitness (CRF) goals. Select a safe and effective exercise program based on the role that energy balance and exercise play in weight loss and weight management. Implement exercises that increase the strength and endurance of muscles that are fundamental to the development of core stability, and discuss the current recommendations for assessing flexibility and range of motion (ROM) of the low back. Explain the characteristics of a structured exercise program consistent with achieving cardiorespiratory fitness (CRF), strength, body composition, and bone health goals in children, youth, and older adults. Prescribe aerobic exercise (frequency, intensity, and duration) in cardiac and pulmonary rehabilitation programs. Select the proper exercises for people with chronic diseases and specific health conditions. Recognize the signs and symptoms of soft-tissue injuries and describe how to provide acute care for the injuries. Choose effective strategies to monitor and support behavior change as well as ways to apply relapse prevention to exercise behavior. Describe the basic electrophysiology of the heart and be able to identify the normal and abnormal cardiac rhythms to predict the probable effect on exercise performance. Understand why fitness professionals must develop knowledge and skills in the area of legal liability and risk management. 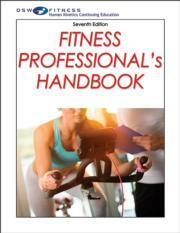 Fitness Professional’s Handbook, Seventh Edition Print CE Course, guides fitness professionals in screening participants, conducting standardized fitness tests, evaluating the major components of fitness, and prescribing appropriate exercise. This course combines standards, guidelines, and research from authorities in the field to arm readers with the knowledge to successfully work with a variety of clients and populations. This continuing education course includes the seventh edition of the text Fitness Professional’s Handbook. The text incorporates information from the most up-to-date edition of ACSM’s Guidelines for Exercise Testing and Prescription and the Physical Activity Guidelines for Americans exercise and physical activity recommendations for adults, older adults, children, and those with special needs. Included with the text is access to an online video library containing 24 video clips demonstrating key techniques from the book. The course stresses the importance of communication between allied health and medical professionals and those in the fitness arena to provide readers with a foundation for prescribing exercise and delivering need- and goal-specific physical activity and fitness programs. A continuing education course for health and fitness professionals looking to refresh or refine their skills in fitness testing and exercise prescription. Edward T. Howley, PhD, FACSM, FNAK, earned his bachelor’s degree from Manhattan College and his master’s and doctorate degrees from the University of Wisconsin at Madison. He then completed a one-year postdoctoral appointment at Penn State University and was hired in 1970 as a faculty member at the University of Tennessee at Knoxville. Dr. Howley taught a variety of courses, including an undergraduate course in fitness testing and prescription and undergraduate and graduate courses in exercise physiology. He retired in 2007 and holds the rank of professor emeritus. In addition to the previous editions of this book, Dr. Howley has authored three books, four book chapters, and more than 60 research articles dealing with exercise physiology, fitness testing, and prescription. He is a fellow in the National Academy of Kinesiology and served as chair of the Science Board of the President’s Council on Physical Fitness and Sports in 2006-2007. In 2007-2008 he served on the Physical Activity Guidelines Advisory Committee that evaluated the science related to physical activity and health and generated a report for use by the U.S. Department of Health and Human Services to write the 2008 Physical Activity Guidelines for Americans. Most of Dr. Howley’s volunteer efforts have been with the American College of Sports Medicine (ACSM). He was involved in the development of certification programs and served as president in 2002-2003. He served as editor in chief of ACSM’s Health & Fitness Journal for seven years and as chair of the program planning committee for the annual ACSM Health and Fitness Summit meeting. In 2007, Howley was recognized for his professional contributions with the ACSM Citation Award. In his leisure time, he likes to golf, ride his bike, travel, and play with his grandchildren. Dixie L. Thompson, PhD, FACSM, FNAK, is vice provost and dean of the graduate school at the University of Tennessee at Knoxville and is a professor in the department of kinesiology, recreation, and sports studies. She graduated from the 2008 class of the Higher Education Resource Services (HERS) Bryn Mawr Summer Institute, held at Bryn Mawr College. The institute is a professional development program dedicated to the advancement of female leaders in administration of higher education. She also participated in the 2009-2010 Academic Leadership Development Program sponsored by the Southeastern Conference Academic Consortium. Dr. Thompson focuses her research on the health benefits of exercise for women and techniques used for body composition assessment. She is the author of over 70 peer-reviewed publications and numerous articles for fitness professionals and general audiences. She is a former associate editor in chief for ACSM's Health & Fitness Journal and former editor in chief for ACSM's Fit Society Page Newsletter. Dr. Thompson is a fellow of the American College of Sports Medicine (ACSM) and a member of the ACSM Board of Trustees. She is a fellow of the National Academy of Kinesiology. She is a past president of the Southeast Chapter of ACSM and former chair of the Physical Fitness Council for the American Alliance for Health, Physical Education, Recreation and Dance. Dr. Thompson received her BA in physical educatiion and MA in exercise physiology from the University of North Carolina at Chapel Hill. She earned her PhD from the University of Virginia.